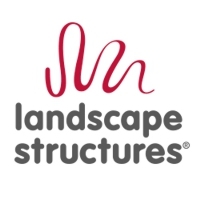 Since 1971, Landscape Structures Inc. has been the leading manufacturer of commercial playground equipment in the world. The employee-owned company designs community and school playgrounds that encourage kids of all ages and abilities to learn persistence, leadership, competition, bravery, support and empathy through play. Landscape Structures pushes the limits—of design, inclusion, play—to help kids realize there is no limit to what they can do today and in the future. Interestingly, Landscape Structures began its history of innovation even before its doors opened for business. In 1967, Steve King created a revolutionary concept called continuous play for his final thesis project at Iowa State University. With continuous play, kids can move from playground component to playground component without touching the ground. This new type of design saved space while encouraging independent decision-making and interaction among kids, which is an important ingredient in a child's development. Through the years, Landscape Structures has continued to introduce other pioneering innovations including the first post and clamp-based playsystem known as PlayBooster®, the first gyroscopic playsystem called Evos® and HealthBeat®, the first gym-quality outdoor fitness system. Furthermore, Landscape Structures also has been at the forefront of creating inclusive playground equipment for children of all abilities. In addition to inclusive playground components, Landscape Structures strives to create entire inclusive play environments to welcome children and families of all abilities to play, learn and grow together. Design matters. Play matters more.™ We design playstructures to complement their surroundings. But more than that, we design them to complement childhood. Every aesthetic choice is also a choice for fun, for growth, for learning, for exploration. All the things that make play part of shaping better adults. And that’s what really matters. Create the Centre by connecting the Loft, Fire Station and Market Cafe and enhance the fun for 2- to 5-year-olds. Interactive panels prompt adult-child conversations and encourage learning while they play, and various climbers, slides, tunnels and crawl spaces challenge the physical dexterity of toddlers and preschoolers. The unique look of net climbing structure offers tons of opportunities to climb, crawl and hang out. The open-ended play experiences engage creativity and critical decision making as kids ages 5 to 12 maneuver their positions from one challenge to the next. Keep your cool with SkyWays™ Shade Products from Landscape Structures. Designed to meet the demands of both heat and sun, SkyWays shades kids and families from up to 97 percent of harmful UV rays and keeps structures as much as 30-degrees cooler. They are perfect for the playground and anywhere a large amount of shade coverage is needed—at the ball field, on the beach, in a parking lot and much more. Extreme fitness is gaining popularity based on current TV shows, and now you can create your own custom fitness course using combinations of 38 predesigned pieces. Each piece can also be a challenging obstacle for parkour or freerunning. Patent-pending GeoPlex™ climbing panels can be transformed into a wide range of climbers, towers, towers with nets, and post-and-deck attachments for PlayBooster® playgrounds for kids ages 5 to 12. These abstract, geometric designs come in many colors to create your favorite look - natural, contemporary, space-ace, circus and much more! This patent pending merry-go-round offers plenty of space for more kids of all abilities. Once aboard everyone faces the center so they can easily share smiles, laughter and conversation while in orbit.